A comprehensive new analysis involving researchers from UEA warns that the target of limiting global warming to 1.5ºC could soon become too economically expensive to justify, despite the benefits it could provide. Researchers from UEA, the London School of Economics and Political Science, and Imperial College London assessed almost 200 published academic papers on climate change, including recent studies about the economics of limiting global warming to 1.5ºC. They noted that economics analyses produce inconclusive results about the value of limiting global warming to 1.5ºC. The paper states: "Due to large uncertainties about the economic costs and, in particular, the benefits, there can be no clear answer to the question of whether the 1.5ºC target passes a cost-benefit test." Nonetheless, it draws attention to large benefits of limiting global warming to 1.5ºC instead of 2ºC: "There is evidence to suggest that limiting warming to 1.5ºC reduces the risk of crossing climate tipping points, such as melting of the Greenland and Antarctic ice sheets, but the reduction in risk cannot presently be quantified." Prof Simon Dietz of the ESRC Centre for Climate Change Economics and Policy and the Grantham Research Institute on Climate Change and the Environment at the London School of Economics and Political Science, who is the lead author on the paper, said: "The evidence we have simply does not give us a clear answer on whether the benefits of limiting warming to 1.5ºC exceed the costs. But if we want to keep the option open to limit warming to 1.5ºC, then unless we discover a much cheaper way to remove carbon dioxide from the air, and if we want to avoid risky methods of blocking out sunlight, we have to pursue the goal of 1.5ºC now." Co-author Prof Rachel Warren, from UEA's Tyndall Centre for Climate Change Research, said: "Our review of recent studies shows the significant projected benefits of limiting global warming to 1.5ºC rather than 2ºC above pre-industrial levels for both human and natural systems. These benefits include preservation of Arctic sea ice, reduced biodiversity loss, and reduced damage to coral reefs." The paper acknowledges the larger financial investments required to cut emissions sufficiently to limit global warming to 1.5ºC instead of 2ºC, particularly if policies are not designed well. It states: "The remaining carbon budget consistent with 1.5ºC is very small and the global economy would need to be decarbonized at an unprecedented scale to stay within it, likely entailing larger costs. "Any further delay in pursuing an emissions path consistent with 1.5ºC likely renders that target unattainable by conventional means, instead relying on expensive large-scale CDR (carbon dioxide removal), or risky solar radiation management." Solar radiation management could involve, for instance, reducing the amount of the Sun's energy that reaches Earth by injecting aerosol particles into the atmosphere to block out some sunlight, in order to counteract the warming caused by rising levels of greenhouse gases. This is largely untested and has significant associated risks. Another co-author of the paper, Dr Ajay Gambhir of the Grantham Institute -- Climate Change and the Environment at Imperial College London, said: "The comparative benefits of keeping global warming below 1.5ºC, compared to 2ºC, are striking. So even though it will be significantly more challenging to achieve the lower temperature goal, in terms of the required investments, strength of policy and greater reliance on measures such as carbon dioxide removal, we must not close the door on it. This means we need to step up the immediacy and pace of action." 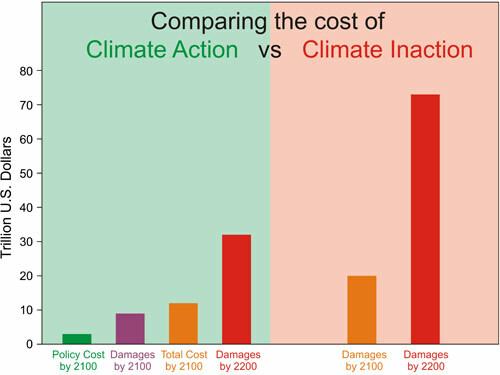 The paper draws attention to studies showing that the carbon price consistent with limiting global warming to 1.5ºC would be more than US$100 per tonne of carbon-dioxide-equivalent by 2020, and about three times higher than the price required to stop warming of more than 2ºC. This study is launched ahead of the planned publication by the Intergovernmental Panel on Climate Change in October 2018 of a special report on global warming of 1.5ºC. National governments are currently carrying out a collective stocktake, named the Talanoa Dialogue, of their contributions to the implementation of the Paris Agreement on climate change, which includes a commitment to "holding the increase in the global average temperature to well below 2ºC above preindustrial levels and pursuing efforts to limit the temperature increase to 1.5ºC above preindustrial levels."